Frankie Curtis describes herself as an illustrator with an overactive imagination. We think her intricate illustrations are as if her mind has taken a wander into a playful parallel universe of crazy characters. These characters appear over everything from walls and ceilings, to furniture and musical instruments. And they leave you with a smile. 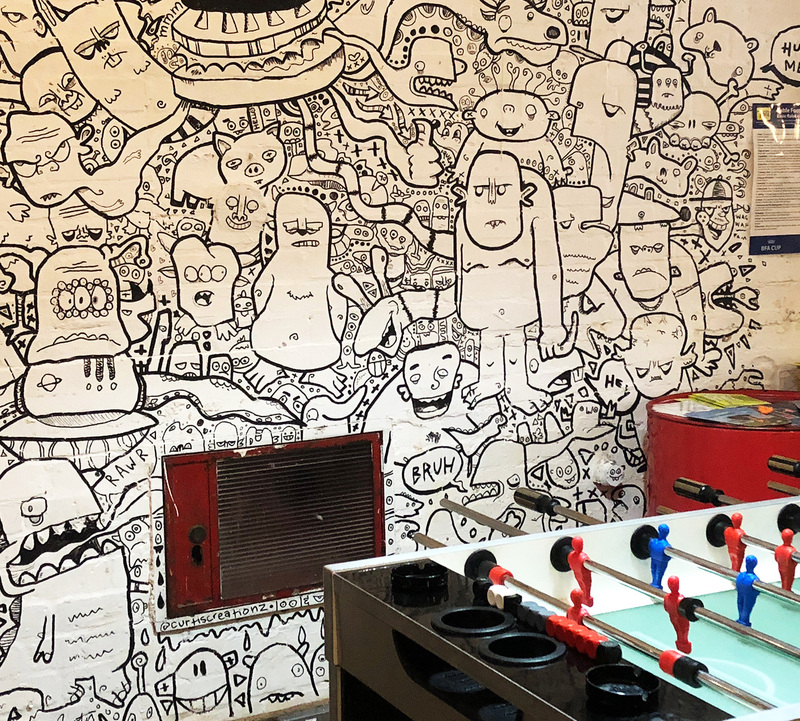 You may already recognise Frankie’s doodles from murals in Matthews Yard and First Floor Space, as well as our social media headers earlier this year. We wanted to find out more about the lady behind the pen, so we caught up with Frankie for a chat. Croydonist: First of all, what’s your connection with Croydon? Frankie: I was born here actually! Croydonist: Where can we see some of your creations? Frankie: All of my work is online, just search for ‘Curtiscreationz’ or if you want to see it in person, head down to BRGR&BEER in Matthews Yard to see a mural, as well as Art Rebellion in Coulsdon. I also have a mural in the Croydon Arts Store (CAS) and will actually be running an exhibition from 16 May until 20 May if you would like to come and meet me, do some fun workshops and see some interesting artwork! Croydonist: How did you become an illustrator? Frankie: I was born to do this. From as long as I can remember I have been an artist, so it really led me down this path, I studied it at college and then university and honestly could never ever imagine doing anything else! Croydonist: You have a very characterful style – what or who have been your main influences? Frankie: I grew up watching a lot of cartoons which is where the inspiration came from – it was my dream to work for Disney creating my very own characters. Mainly The Simpsons when I was younger, but now my style really has adapted and I take inspiration from many people, Tim Burton’s characters are simply beautiful, I have recently found a few artists that have helped me develop this, and feel more motivated to become an established artist; Korp, My Dog Sighs, and Mr Doodle to name a few. Frankie: One gentleman asked me to design a collection of Squirrels with nut based weapons. I found the concept a little random, but it was great fun! Croydonist: What’s your preferred medium? Frankie: Pens. Pens. Pens. I LOVE PENS! I do a lot of digital work using my Wacom tablet and Adobe software. But pens are my favourite, POSCA are the best brand for me. 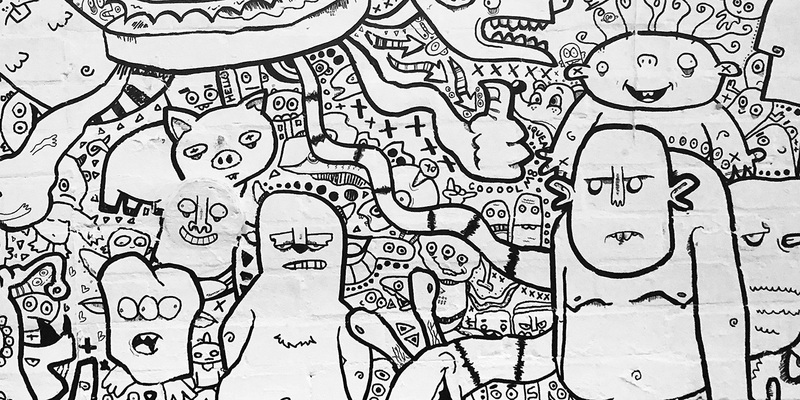 Croydonist: Your murals in particular are very detailed – how long does a piece like that take you? Frankie: Much less time than you would imagine. I would say from 2–5 hours max depending on the size! Croydonist: Do you have to plan for a new piece of work, or does your imagination take control? Frankie: I draw entirely with my imagination – I don’t think, I just feel and let my hand do the work. Sometimes I start drawing shapes and turn them into characters, each one is entirely unique. I just love that I can create whatever I want simply with a pen. Nothing stands in my way. Croydonist: Maybe a bit of a broad question, but what do you do for inspiration? Frankie: My studio is where I create most of my work, the walls, ceiling and furniture is covered in doodles, which always helps me with creating new work. However, I think inspiration can come from anywhere, films, music, the people you see. I keep my sketchbook with me for when inspiration strikes. Croydonist: Dream drinks party time – if you had to invite 3 artists/illustrators to dinner (dead or alive) who would they be? Frankie: Number 1 for me would be the wonderful Walt Disney – he has the most incredible and inspirational story and really never gave up on his dreams which definitely inspires me. He literally is a staple of not only my childhood, but childhoods from all over the world. Another artist I would invite would be Tim Burton – I love his characters, the extremities of their bodies, and how he really pushes the boundaries when creating the most eerily beautiful illustrations – his work has helped me to really explore the human form. 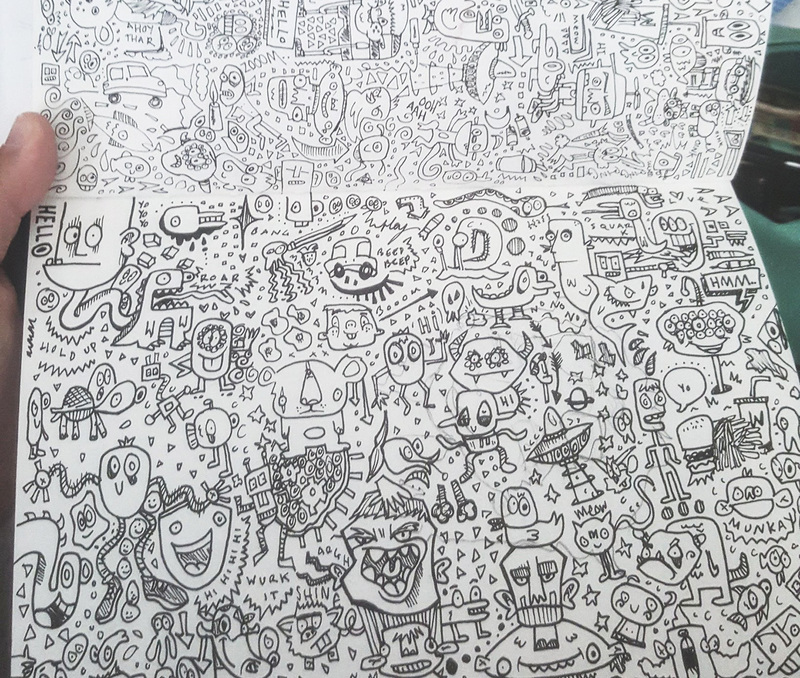 The last is an artist called ‘Mr Doodle’ – his work is relatively similar to mine, and he is doing so well… showing his work all over the world. I am working towards doing the same thing, and would like to know his secrets, and maybe even do a collab! Croydonist: What’s next for you this year? Frankie: I am looking to create my own wallpaper, take part in a few more exhibitions, keep trying to build myself as a successful illustrator, and get as many people to see my work as possible. I am exhibiting in ‘The Loft’ in CAS which is based in the Whitgift Centre, it will be running from 16 May until 20 May so come and meet me, take part in some workshops and see some of my art in person! Croydonist: Favourite spot for a drink? Frankie: It used to be Tiger Tiger when I was 18, but I really do enjoy Turtle Bay … 241 cocktails who can complain about that! Frankie: RISE Gallery is pretty awesome, they do a lot for the local artists too which really helps the community and makes Croydon a more beautiful place to be. Frankie: Of course, BOXPARK – the food is great, I love the atmosphere and the vibes are just great. Frankie: There’s a golf course near Oaks Farm that I usually walk my dog through – it’s beautiful and hard to believe you are in the concrete jungle when you see it. Croydonist: Favourite spot to daydream? Frankie: Probably Shirley Hills, the viewpoint looks over the London skyline and is always nice to go and watch the world go by. Thanks to Frankie for chatting to the Croydonist. You can see more of her work here and here. All images, except the header image and image 1, courtesy of Frankie Curtis.